The Whitworth University Board of Trustees announced today that the landmark biology and chemistry building being constructed at the heart of campus will be named in honor of outgoing president Bill Robinson and his wife, Bonnie. Scheduled to open in fall 2011, the William P. and Bonnie V. Robinson Science Hall will be the largest, most expensive and, most important academic facility built by Whitworth in its 120-year history. "It would be difficult to overstate Bill's positive impact on Whitworth; his leadership has contributed to tremendous growth and improvements on the campus as well as to a strengthened commitment to Whitworth's distinctive mission," says Board Chair Walt Oliver. "The entire Whitworth community is deeply indebted to Bill and Bonnie for all the ways they have served the university. In light of their contributions, it is appropriate for a facility that will contribute so significantly to Whitworth's mission to educate the mind and heart to be named the William P. and Bonnie V. Robinson Science Hall." Robinson became Whitworth's 17th president in July 1993 and will be the second-longest serving president in the university's history when he steps down on June 30. During his tenure, the number of freshman applications to Whitworth has increased 565 percent to 6,397 for the coming fall; enrollment has grown 60 percent to 2,781 students while steadily improving student academic profile and selectivity; and retention and graduation rates have reached record highs well above national averages. More than $83 million in campus improvements have been made, including a new center for the visual arts, a landmark general academic building, three new residence halls and several outdoor athletics facilities, along with the new biology/chemistry building. Financial support from alumni and friends has increased steadily, contributing to an increase of nearly $75 million in the university's endowment before the recent market downturn. Known for his relational and approachable style, Robinson has devoted much of his energy to connecting in person and in writing with students, employees and friends of the university. His award-winning monthly newsletter, Of Mind & Heart, is read by more than 23,000 people inside and outside the Whitworth community and is one of his favorite ways to champion Whitworth's mission as well as its faculty and students. "It is an immense honor for Bonnie and me to have a building bear our names, particularly one that is such an important reflection of Whitworth's commitment to academic excellence," Robinson says. "Knowing this facility will serve the students we love is deeply gratifying. We are very thankful to the board for recognizing us. But we know beyond any doubt that faculty, staff, donors, alumni and students have been the real heroes in Whitworth's success. Understanding our name symbolizes all of these contributions, we could not be more honored." Whitworth broke ground in November on the new $32 million biology/chemistry building, which will be the first phase of a planned $53 million project to expand the university's science facilities. Since 2000, Whitworth has seen a 50 percent increase in science majors, which now number more than 600 students and represent a quarter of the student body. Growth in enrollment, faculty-student research and competition for top students has created an urgent need for additional science space. 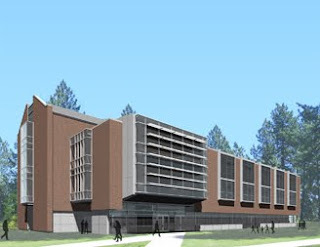 The 63,000-square-foot biology/chemistry building will house state-of-the-art laboratories, instrumentation and classrooms convertible to labs that will meet Whitworth's teaching and research needs for the next 20 years. "I am excited about the new building because of the increased opportunities it offers for faculty-student interactions in both research and teaching laboratories," says Assistant Professor of Chemistry Kerry Breno. "Our students develop the problem-solving focus and lab skills to succeed in graduate school and industry by working with faculty in coaching/mentoring relationships; the relationships built with students in labs are strong. Therefore, I think it is entirely appropriate that the new biology/chemistry building is dedicated to Bill Robinson, who has served our campus so well by building relationships through personal interactions with all members of the community." Michael Le Roy, vice president for academic affairs and dean of the faculty, Whitworth University, (509) 777-3702 or mleroy@whitworth.edu. Scott McQuilkin, vice president for institutional advancement, Whitworth University, (509) 777-3423 or smcquilkin@whitworth.edu.